The Associated Press New York Islanders right wing Josh Bailey scores during overtime of Game 1 against the Penguins. 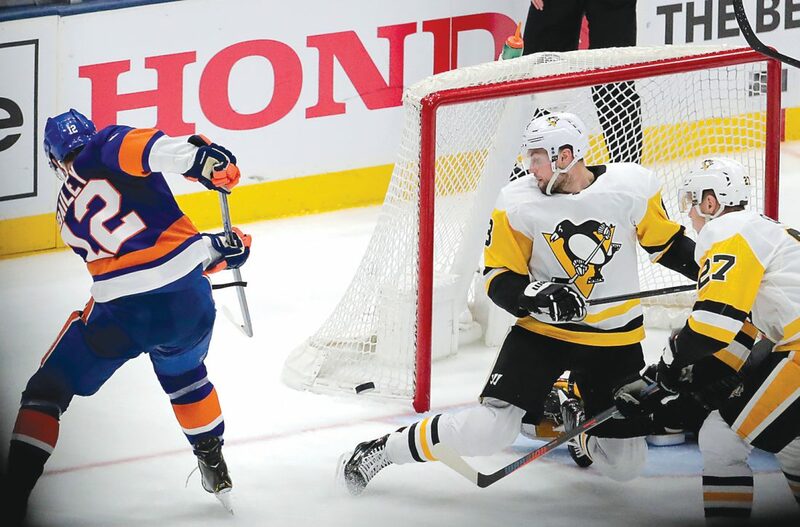 UNIONDALE, N.Y. — Josh Bailey scored on a rebound at 4:39 of overtime and the New York Islanders beat the Pittsburgh Penguins, 4-3, on Wednesday night in the opener of their Eastern Conference first-round playoff series. Notes: Malkin, Sidney Crosby and Kris Letang are the only Penguins players remaining from the 2013 playoff series against the Islanders. New York has five players left — Nelson, Josh Bailey, Casey Cizikas, Thomas Hickey and Matt Martin. … Kessel also scored in each of the last three games during the regular season. … Malkin’s goal was his 63rd in the playoffs, breaking a tie with Bobby Hull for sole possession of 26th place on the NHL’s career list. … Islanders coach Barry Trotz and Penguins coach Mike Sullivan are facing off in the playoffs for the fourth straight year. The previous three were all in the second round while Trotz was with Washington, and the winner of Penguins-Capitals series went on to win the Stanley Cup each time. Up next: Game 2 is Friday night before the series shifts to Pittsburgh for Games 3 and 4.